Railpictures.ca - Bruce Mercer, collection of Doug Lawson Photo: In my collection, a photo taken by Bruce Mercer. On this day, GMD in London, Ontario held an open house with a variety of locomotives on display. 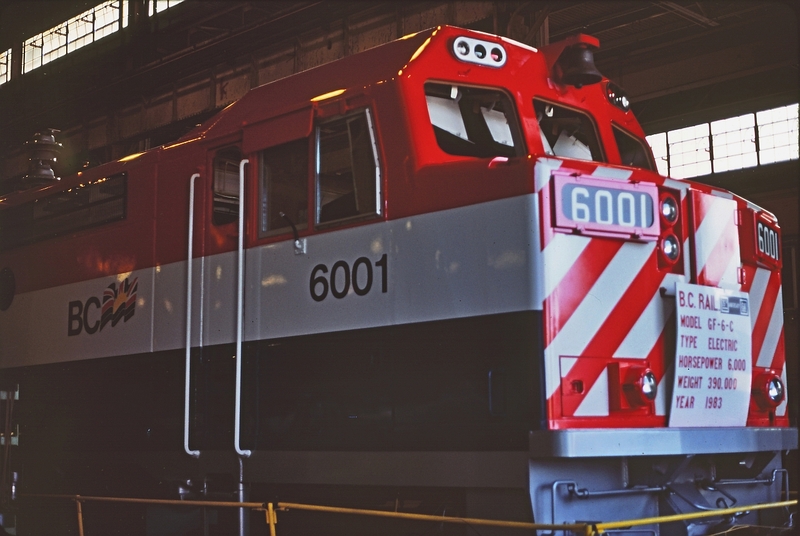 Bruce got a shot of the new BCOL 6001 a GF6C electric locomotive destined for service on the BC Rail Tumbler subdivision coal branch. I can image the smell of fresh paint and the only thing missing in this view is perhaps a “wet paint” sign. Thanks Bruce | Railpictures.ca – Canadian Railway Photography – photographie ferroviaire Canadienne. Copyright Notice: This image ©Bruce Mercer, collection of Doug Lawson all rights reserved. I wonder how they tested these out with no wire around the plant.